Last week I went on a brief baking hiatus and took a little trip down to southern California, where palm trees, beaches, and Hollywood awaited. Even though I can’t complain about the weather in San Francisco, the blue skies and endless sands down there fulfilled my vacation requirements perfectly. 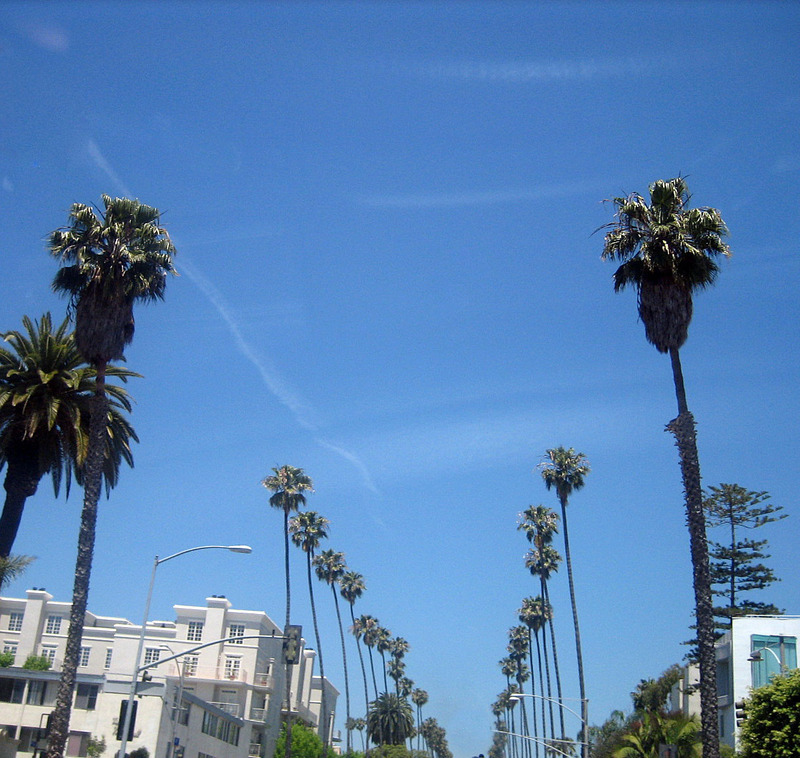 Maybe it’s also the ubiquitous presence of those sublimely silly palm trees – how could you stay serious looking at them? Of course, no baking = dessert research. I took it upon myself to find what sweet things southern California had to offer. 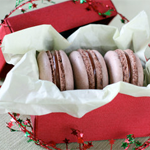 Since I wasn’t planning on eating at any fancy restaurants this time around, my research was limited to the bakeries and cafes – and there were quite a few delicious ones to be found! 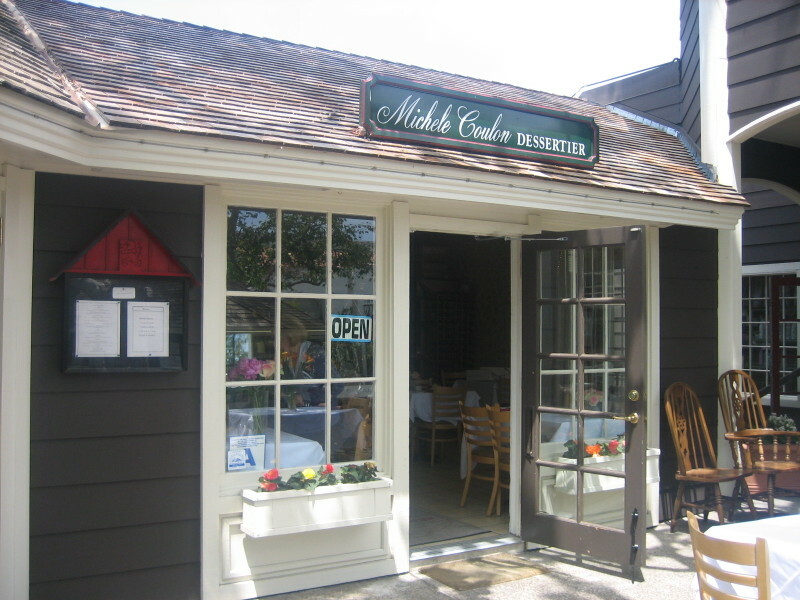 First stop in San Diego: Michele Coulon Dessertier, tucked away on a little street in gorgeous La Jolla. 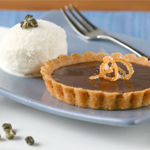 I have to applaud anyone who has the job title of "dessertier"! 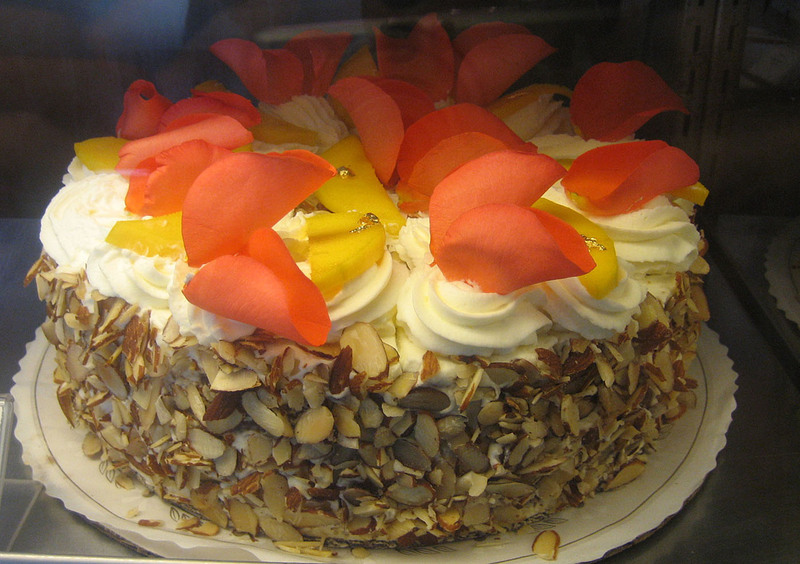 The place serves both lunch and dinner along with a full selection of cakes, tarts, and cookies. 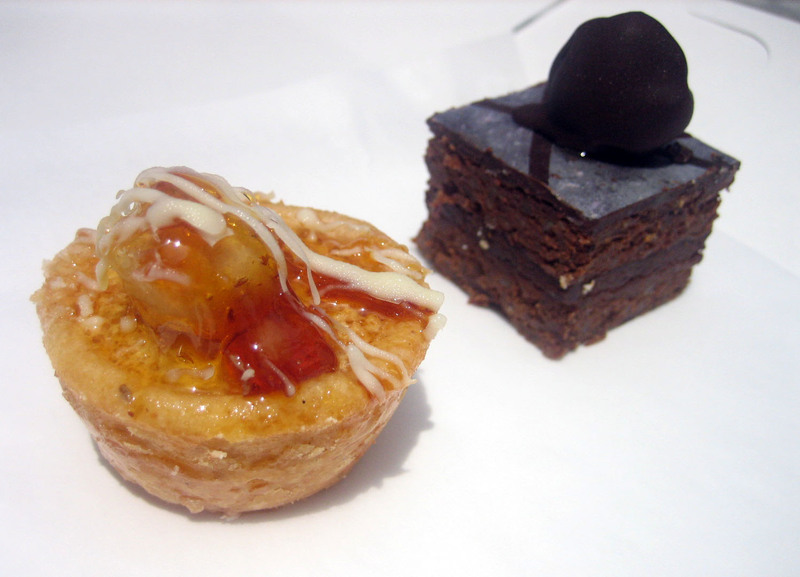 My sister and I shared two of their miniatures: a "lemadamia" tartlet, which had lemon filling with a macadamia and white chocolate topping, and an Amareno cherry cakelet with cherries and chocolate. It’s difficult to tell from the picture but the top of the cherry cakelet was actually dusted with iridescent powder that shimmered gorgeously in the sunlight. 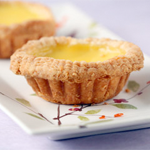 Both of them were quite moist and tasty; I especially like the tang of the lemon tartlet. 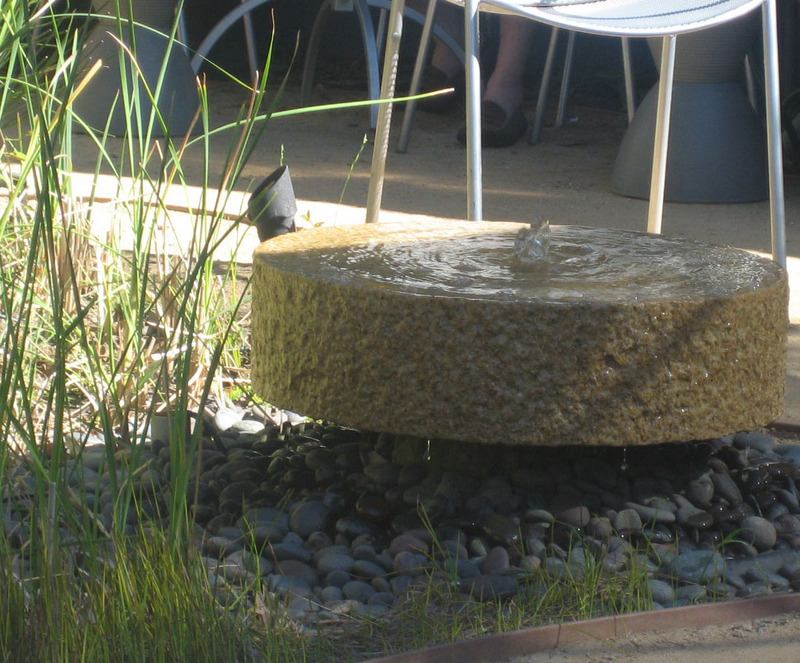 A great place to stop by after strolling downtown or going to the beach. 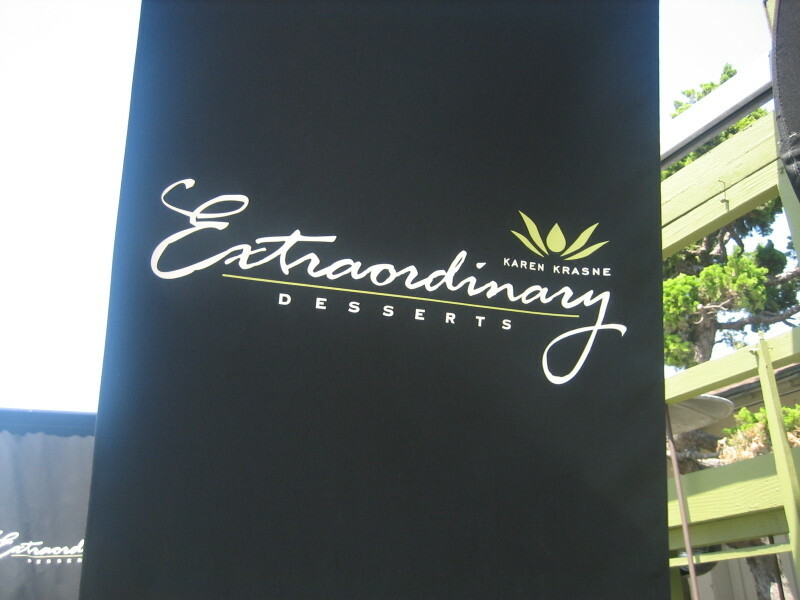 Back in downtown San Diego, we stopped by another popular dessert spot, Extraordinary Desserts. There are two outposts of this bakery, and we visited the one near Balboa Park, which is a collection of parks, gardens, and many of San Diego’s museums, and a great place to go on a weekend. The Fifth Avenue location is the smaller of the two, and is a cozy, intimate space with one side of the room completely lined with Karen Krasne’s creations. 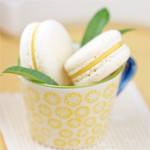 The first thing you notice is the generous use of flowers in decorating the desserts; everything is almost bursting with vibrant color. 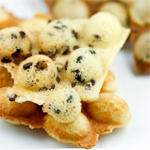 They have a very wide assortment of pastries, and also an intriguing selection of teas and coffees. Definitely a nice place to have afternoon tea! 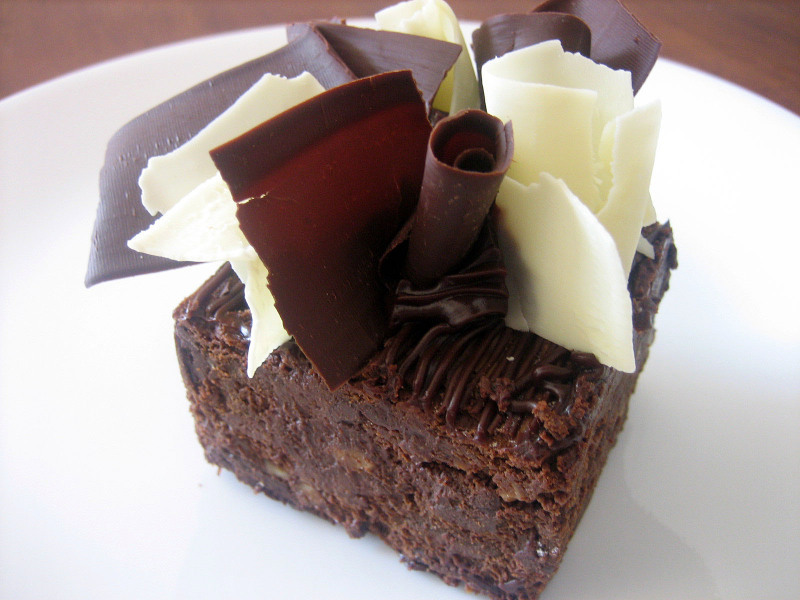 Even the brownie we got had an elaborate crown of chocolate curls; I almost couldn’t bear to eat it! 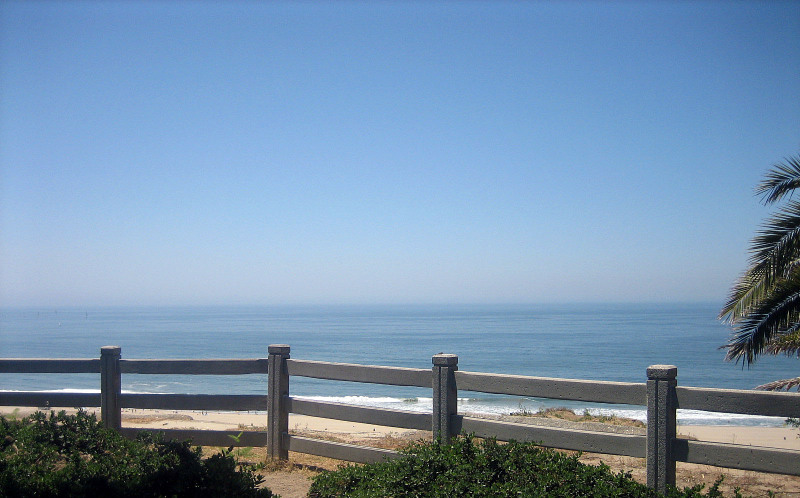 Onto Los Angeles and beachfront views that make you wish you lived here year round. I was told that actually in June and July it can get cloudy-hazy near the beach, so I was lucky to get a postcard-perfect day when I arrived. So did I run out to the beach to enjoy the glorious sunshine? Of course not! I went looking for more pastries instead! And in Beverly Hills, I found cupcakes elevated to haute couture. 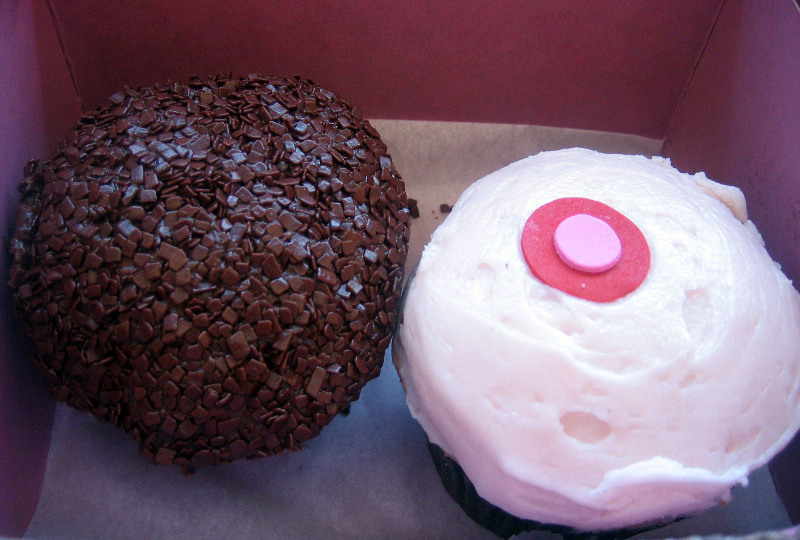 Sprinkles Cupcakes is one of the most successful manifestations of the cupcake trend – it was amusing to see a long line of skinny-trendy Los Angeles natives in their sunglasses and chic clothes waiting to snag one these little dietbusters. The next stop was not a bakery but a must-visit for any foodie: La Sanctuaire, a gourmet’s boutique filled with rare cookbooks, cooking tools, and ingredients. The space is spare and clean, and filled with all sorts of things to catch the foodie’s eye, like a gorgeous green clay teapot from China, or a chalkboard listing dozens of exotic spices for sale, or El Bulli’s latest cookbook, ceremoniously displayed in a glass case. 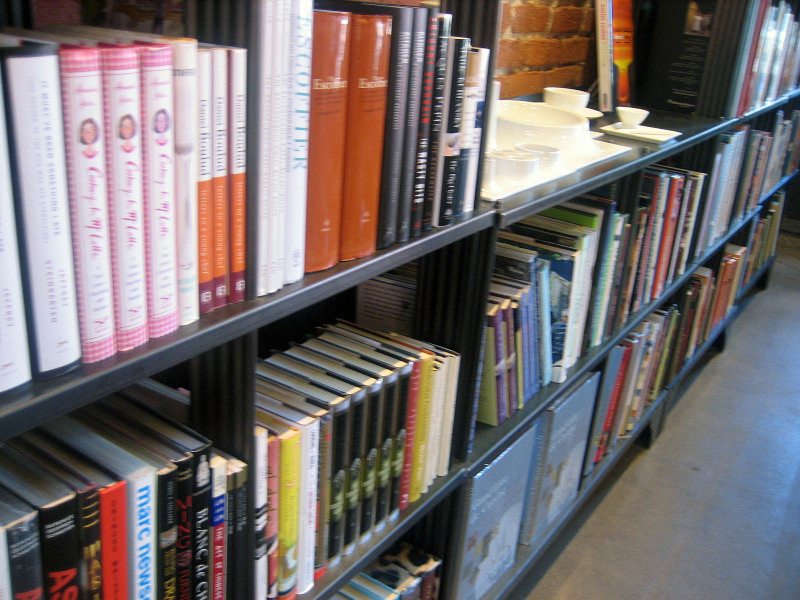 The picture is unfortunately fuzzy but hopefully gives an impression of the dazzling selection of cookbooks from around the world – my kind of bookstore, indeed! The whole store, for that matter. Another must-visit is Jin Patisserie, which is almost exactly the kind of place I would like to have myself if I ever opened a pâtisserie. 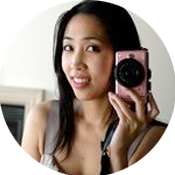 Kristy Choo’s gorgeous creations are served in an elegant, Zen-garden-like patio for the most relaxing of afternoon teas. The kitchen and retail shop are in what looks like a converted cottage, adding to the charm. 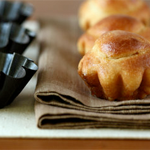 I was impressed by the craftsmanship of the pastries and by the unusual flavor combinations – there is a definite Asian influence to Choo’s flavors, from green tea to jasmine. Choo is also known for her chocolates, which were displayed beautifully in silk boxes – unfortunately, because of the hot day I was afraid to take any home for fear they’d melt! We had the "Afternoon Tea" set, which is perhaps not showed off to best advantage in this photo but which let us sample a variety of her creations. Scones with cream and orange marmalade, quiche, orange pound cake, mousse cakes in flavors of passionfruit, raspberry, and green tea, and a bit of chocolate made for a quite a bit of decadence. 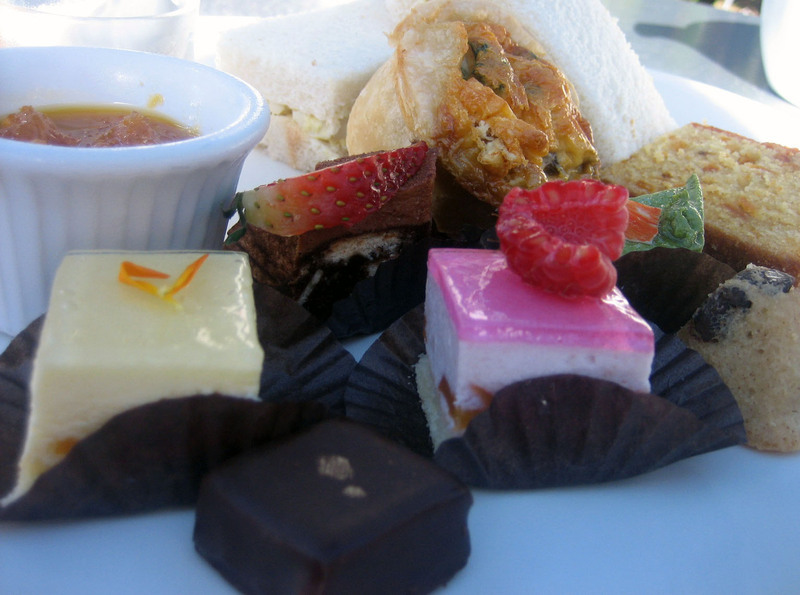 I liked the passionfruit and green tea cakes the best – very light texture and surprisingly intense flavors. I wanted to try more but alas I was sugared out for the day! One of the other things I like about Los Angeles is how lush it is. 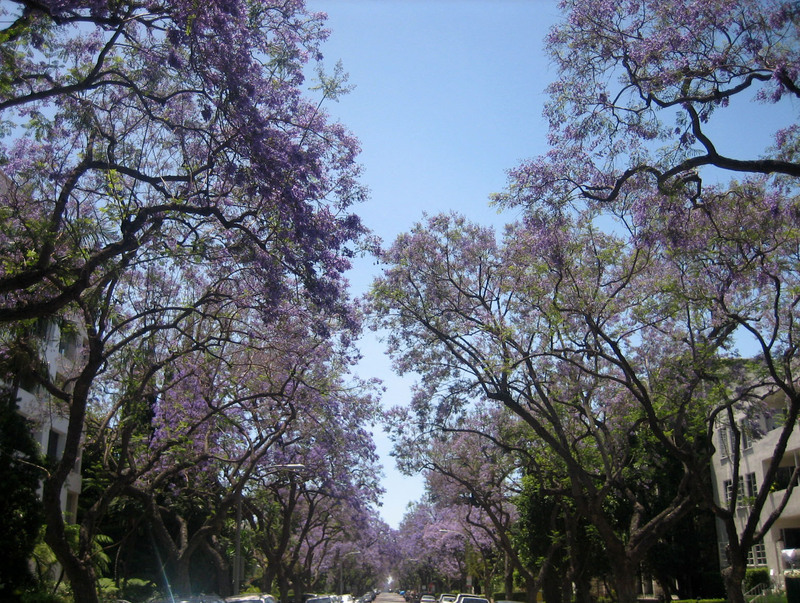 Everywhere you see trees and bushes flowering – like this street filled with purple blooms that smelled like summer. 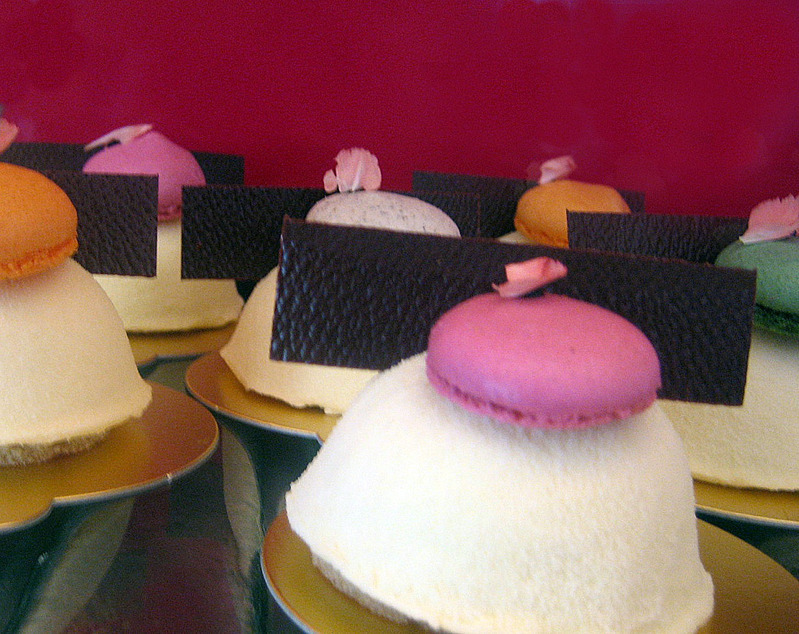 Just around the corner from one of those flower-filled streets is Boule, a very modern pâtisserie in pale blue. 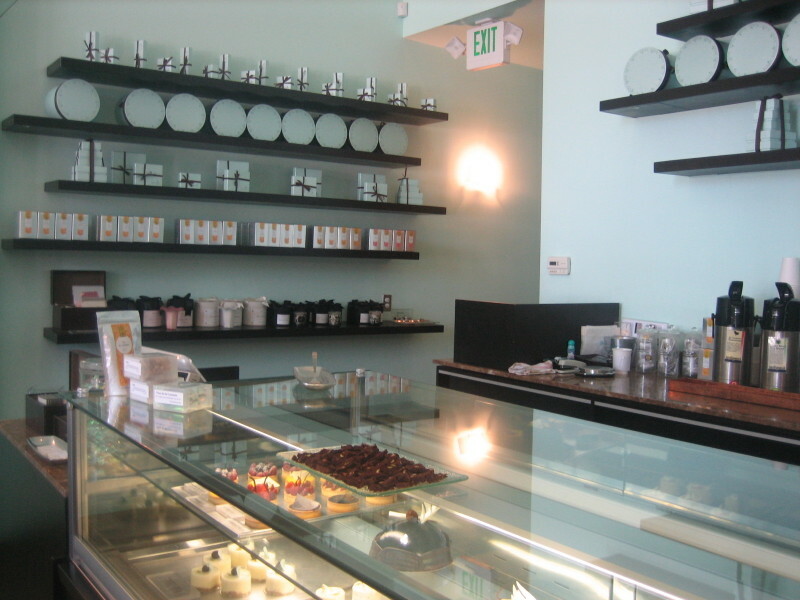 Opened by pastry chef Michelle Myers, it offers an array of chocolates, candies, pastries, and ice creams. 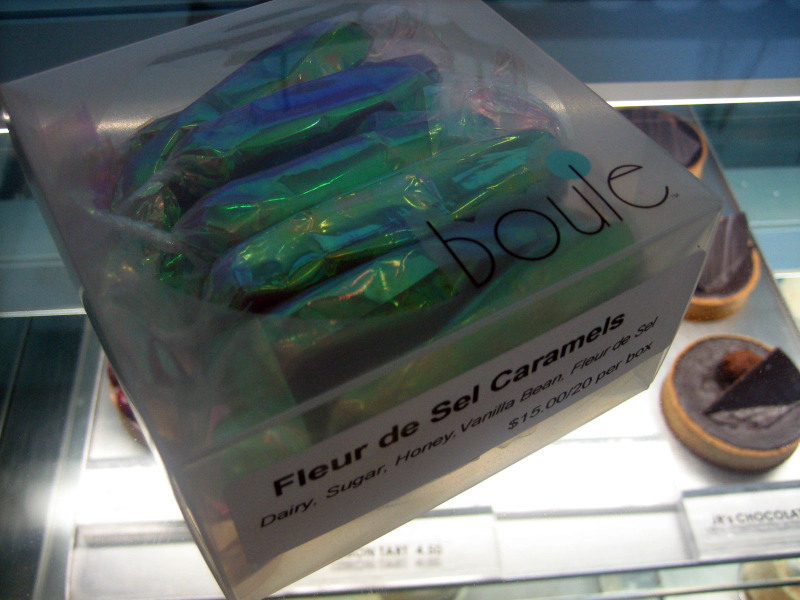 One of their signature items is their fleur de sel caramels, which come wrapped in pretty iridescent paper. Soft and chewy and just the right bit of salty tang. The sweet saleslady offered me one when she heard I hadn’t tried it! 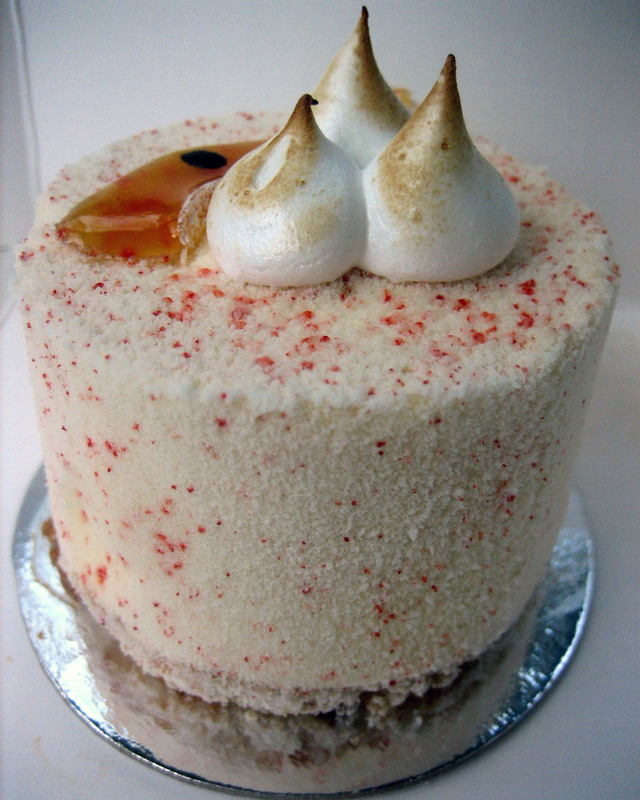 What I got was a little cake of passionfruit mousse with coconut dacquoise. 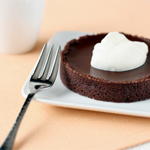 I was amazed by the texture of the mousse – it looks like solid cake, but yields to the fork and just melts in your mouth! I’m not a huge fan of coconut but it went very well with the passionfruit. Very nice! 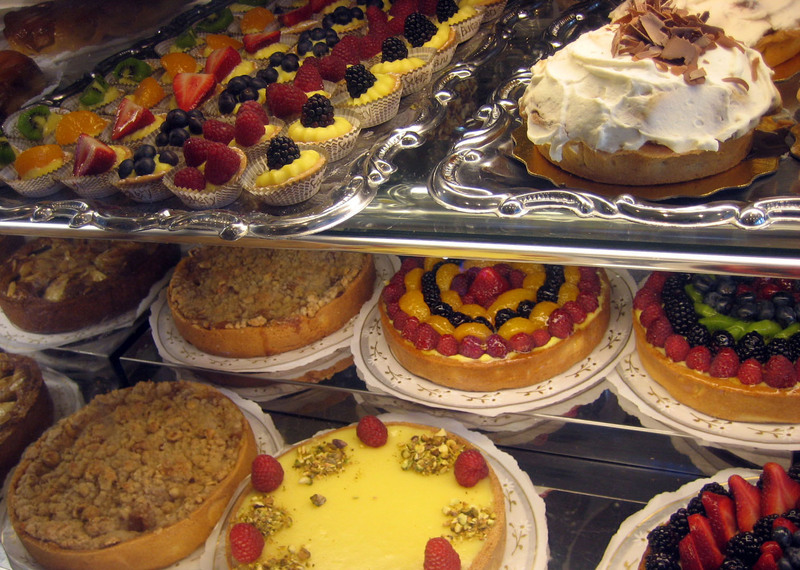 Last stop: Susina Bakery, a beautiful little cafe with a mouthwatering array of pastries to offer. They also have a lunch menu, so it’s possible to spend a lazy Sunday morning here, as many people were doing. 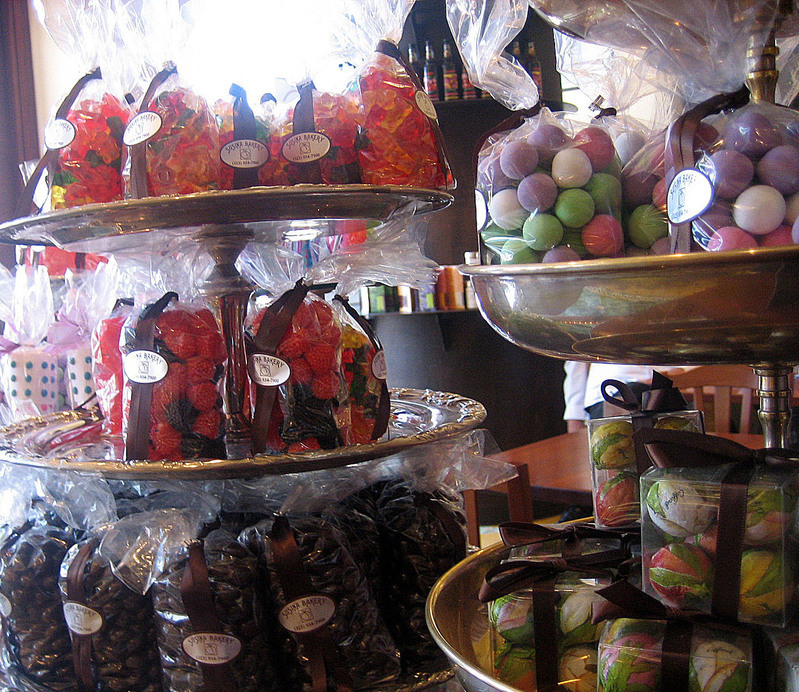 I really like their neatly wrapped bags of candies on the counter. The entire decor of the place is very warm and elegant. 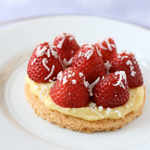 And those fruit tarts!…mmm. All in all, a very sweet and satisfying vacation with sun, surf, and sugar. I’m ever more inspired to get back in the kitchen now! This is a fantastic overview, thanks. It’s great to have all of this info in one place. A few years ago I was in Paris for only two days and I walked and walked until I had seen and tasted every pastry I had heard of! 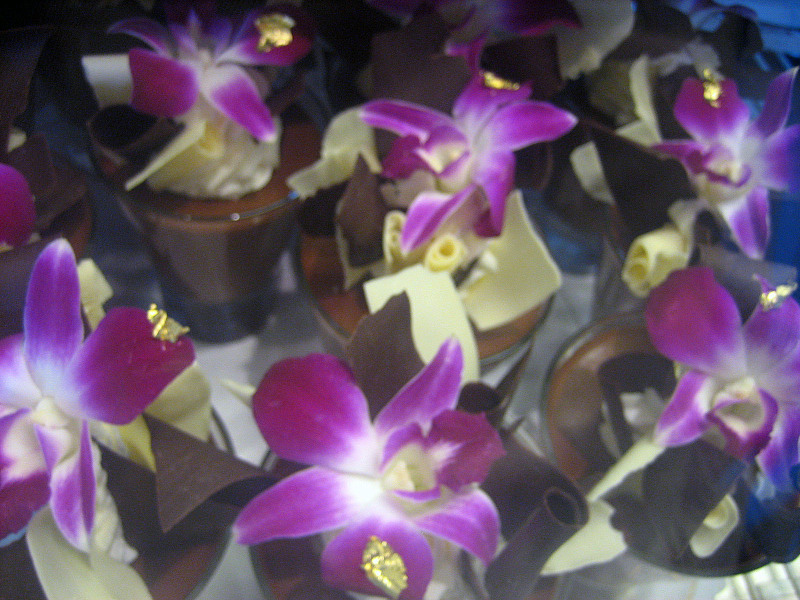 We are a driven group, us dessert makers. oh, my gosh! those look amazing! 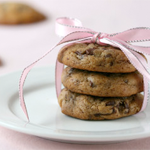 i had to stop and enlarge the cupcake picture…that chocolate one caught my eye for SURE! yum!! 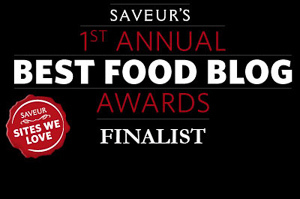 what a great foodie week! I am putting these places on the places to visit when in S. Cal. Thanks for sharing and I hope you had a nice time! You got some lovely photographs and it sounds like a perfect vacation. La Sanctuaire is at the top of my list of places to visit should I find myself in Southern California. I know! I went on a mad pastry quest in Paris too! 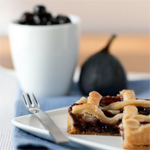 There’s just always one more pastry to sample! Thanks! The Sprinkles certainly was very nice-looking! Glad you enjoyed it, and hope you make it over to the States sometime! La Sanctuaire is definitely worth a vist; so many unique things in there! Thanks! It was fun checking all the places out. 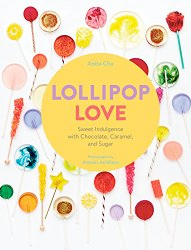 Anita, this post should have been accompanied by a warning: “Do not read if hungry!” Thanks for the valuable information and lovely pictures. I try to make it down to LA once or twice a year and your recommendations sound excellent. I am especially dying to go to Le Sanctuaire, if only to pine after a Thermomix or some of his brilliant collection of books and culinary toys.